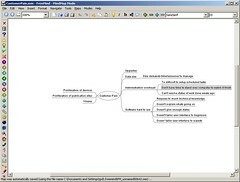 I’ve be using this FreeMind mind mapping and outliner software for about two months. I gotta say, its the best piece of software I’ve downloaded in a long time. Very easy to use, runs on Windows Linux and Macs, comes with fantastic online help and can generate output formats in PDF, SVG, PNG, GIF, HTML and open office.